While in our line of work there are no ‘typical’ engagements, many of our client relationships begin with the establishment of efficient accounting and bookkeeping processes and systems. This critical foundation creates a reliable, consistent set of metrics that BGS can then use in a strategic advisory capacity. For instance, once a business is set up to generate consistent and accurate accounting reports, BGS can work with the company in a CFO function, helping to analyze data, assess profitability, project cash flows, and more. We can then build upon the work completed in these stages to develop a complete business strategy or refine an existing plan. 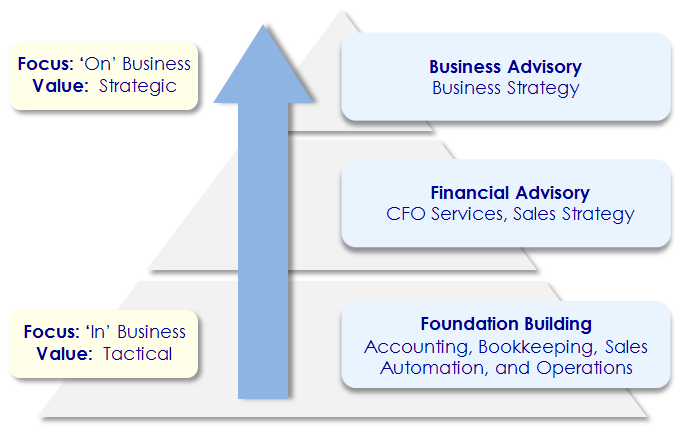 For the business owner, the end result of this holistic advisory approach is a transformed outlook on the business. Rather than focusing “IN the business” – a state in which one focuses only on the day-to-day, tactical running of the business – the business owner begins to focus more “ON the business,” with a more strategic, long-term outlook. It is the key to OPERATING AT OPTIMUM, and critical to the growth and success of the enterprise.